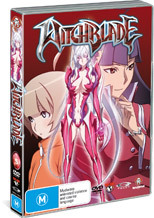 The anime Witchblade series is truly racing ahead with volume 5 finally arriving on DVD which thoroughly progresses the series to the next level. Originally based on an Image comic of the same name, Witchblade has received a true anime face lift that makes this one of the most unique anime series in quite some time. As the holder of the Witchblade, this ancient artifact gives the female wielder supernatural powers and this latest incarnation, things come to a head as the corporate world is challenged and the artifact is challenged to where it is a power of good or evil. When a new witchblade is created by Nishida that can only be used by men entitled the "Ultimateblade", this may be the device needed to prevent Takayama from achieving his goals. Meanwhile Masane struggles with her own demons as she attempts to prevent the Witchblade from fully transforming herself into the being she fears the most. It's a classic anime series with a touch of "Western" storytelling in some aspects, volume 5 contains some great episodes, good animation and some quite interesting special features that makes this perfect addition to your Witchblade collection.